HOME > POP Hollywood > Moulin Rouge! Moulin Rouge! (, from) is a 2001 Australian-American jukebox musical romantic comedy film directed, co-produced, and co-written by Baz Luhrmann. 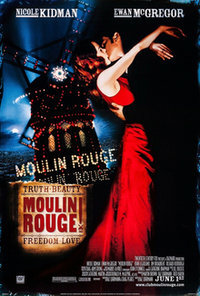 It tells the story of a young English poet/writer, Christian (Ewan McGregor), who falls in love with the star of the Moulin Rouge, cabaret actress and courtesan Satine (Nicole Kidman). It uses the musical setting of the Montmartre Quarter of Paris, France. At the 74th Academy Awards, the film was nominated for eight Oscars, including Best Picture and Best Actress for Nicole Kidman, winning two: for Best Art Direction and Best Costume Design. It was the first musical nominated for Best Picture in 10 years, following Disney's Beauty and the Beast (1991). In BBC's 2016 poll of the greatest films since 2000, Moulin Rouge! ranked 53rd. This webpage uses material from the Wikipedia article "Moulin_Rouge%21" and is licensed under the GNU Free Documentation License. Reality TV World is not responsible for any errors or omissions the Wikipedia article may contain.